"Delicious, moist rhubarb cake, served with a caramel, brown sugar sauce." Preheat oven to 350 degrees F (175 degrees C). Grease a 9-inch square cake pan. Beat 2 tablespoons softened butter and 1 cup white sugar with an electric mixer in a large bowl until light and fluffy. Beat egg into the butter mixture. Mix 2 cups flour, baking powder, baking soda, and salt in a bowl; add flour mixture alternately with buttermilk, to the butter mixture, stirring just to combine into a batter. Fold rhubarb into the batter just until incorporated; pour into prepared pan. Stir 2 tablespoons melted butter, 1/4 cup flour, and 1/4 cup white sugar together in a bowl until evenly moist; sprinkle over the batter. Stir 1/2 cup butter, brown sugar, cream, and vanilla together in a saucepan over medium heat; bring to a boil and cook for 1 minute. Serve sauce immediately with the warm cake. I doubled the rhubarb as per previous reviews. Cake was delicious and our guests loved it too! Wonderful? Everyone young and old loved it. I would make double next time. We had extra caramel sauce which I saved for another use. Excellent. Will definitely make again. Great recipe. I added a bit more rhubarb, making no other changes. I did not serve with the sauce and it was great the way it was. 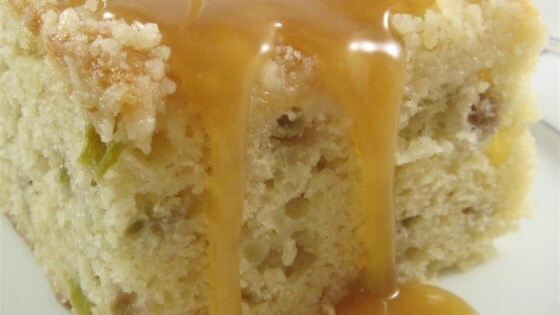 It's a great cake base and freezes well too. I really liked this. Next time I will add a little more rhubarb. (I love rhubarb) I did not add the caramel sauce. (trying to watch my calories) Will make again!